This rare and unique black diamond gets it's name from de Grisogono the famous Swiss jeweler and cutter of diamonds, who together with Fawaz Gruosi another famous Swiss jeweler had been responsible for creating the current enthusiasm for black diamond jewelry. De Grisogono, the world renowned black diamond cutting specialist, was responsible for cutting the diamond in the style of an old Moghul-cut diamond, and it was in his honor the diamond was subsequently named as "the Spirit of de Grisogono." The name de Grisogono today represent the Geneva-based Swiss luxury jewelry company founded by Fawaz Gruosi in 1996, specializing in high-end jewelry, time pieces and accessories, and grown into a popular international brand name with a network of 140 sales outlets around the world. Fawaz Gruosi launched the de Grisogono brand name in 1996, by opening the first de Grisogono boutique on rue du Rhone, Geneva. It might even be possible that the diamond was given the name "the Spirit of de Grisogono" to mark the launching of the brand name and the opening of the first boutique in Geneva. The Spirit of de Grisogono rough diamond when first discovered in the Central African Republic - one of only two countries in the world where black alluvial diamonds are commonly found - had a weight of 587 carats. Being a polycrystalline carbonado, it may not be appropriate to list this diamond with other conventional diamonds. Yet, when it so listed with other extraordinarily large rough diamonds, discovered in diamond producing countries of the world, such as India, Brazil, South Africa etc. the Spirit of de Grisogono rough diamond, becomes the 18th largest rough diamond discovered in the world so far. See table below. The following table is a comprehensive list of 68 known faceted famous diamonds in the world greater than 100 carats arranged in descending order of weights. The table was painstakingly collated by our staff after collecting all available information. The list may not be entirely comprehensive as some diamonds might have been inadvertently omitted or due to lack of precise information. We have tried our best to make the list all inclusive. The list will be revised as more information on other new diamonds are received. According to this table, the largest faceted diamond in the world is the 545.67-carat, cushion-cut Golden Jubilee diamond, followed by the 530.20-carat Cullinan I diamond. The 3rd largest faceted diamond is the 489.07-carat, rectangular-cut, unnamed black diamond, that was sold at an auction in 2001. 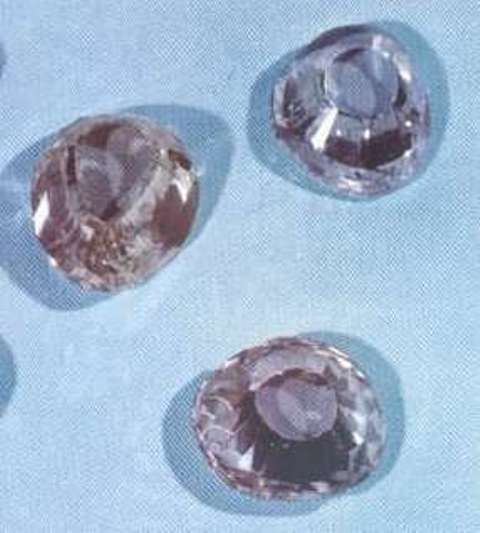 The 407.48-carat, shield-shaped Incomparable diamond and the 317.40-carat, cushion-cut, Cullinan II, occupy respectively, the 4th and 5th positions on the table. Next comes the 312.24-carat, Spirit of de Grisogono, the subject of this webpage, which is the 6th largest faceted diamond in this world. The original rough diamond that weighed 587 carats was mined from the alluvial deposits of the Central African Republic, one of two countries in the world, where alluvial black diamonds have been discovered, the other being Brazil in South America. Other details of the diamond such as the date of discovery, the mine of discovery, original owners of the diamond etc. are not known. The massive black rough stone arrived in Switzerland after it's purchase by Fawaz Gruosi, the famous Swiss jeweler. The diamond was cut by the world renowned black diamond cutting specialist, de Grisogono, in whose name the diamond was subsequently named. De Grisogono was also responsible for the cutting of the heart-shaped Gruosi diamond in 1998, another black diamond owned by Fawaz Gruosi. The cut employed on the stone was a modified old Moghul-cut, an appropriate design selected by the experienced cutter, to suit the shape of the rough stone. The old Moghul-cut can be seen in many of the historic diamonds that originated in India, during the Moghul period, such as the Orlov diamond, the Taj-i-Mah diamond, and a number of diamonds in the Iranian Crown Jewels. The planning of the cutting and the actual cutting process took more than one year. This is not surprising because black diamonds are usually extremely hard, and the hardness is not evenly spread, with pockets of softer areas within the rough stone, making it difficult to work with. This unusual property of black diamonds is due to their polycrystalline, porous nature, and diamond cutters are not quite sure which diamond shape they will end up with, as they have been forced to change form and shape, when meeting with softer areas in the middle of the stone. The fact that de Grisogono was able to produce a final product, which is the most perfectly cut old moghul-cut diamond in the world, despite the difficult material with which he worked, speaks volumes about his capabilties as a skilled and experienced cutter. 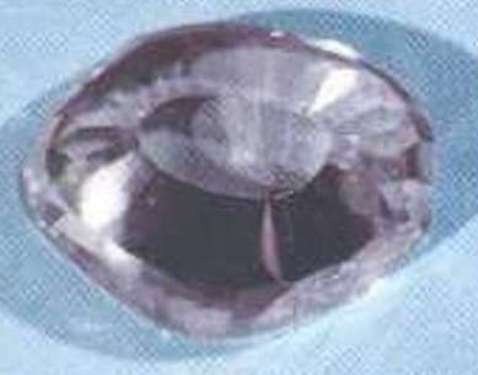 The 587-carat rough diamond was eventually converted to a 312.24-carat old moghul-cut finished diamond, resulting in a loss of 274.76 carats during the transformation. This is equivalent to a percentage loss of 47%, which is attributed to the polycrystalline nature of the diamond. The old Moghul-cut Spirit of de Grisogono black diamond was set by the expert jewelry craftsmen of the Swiss jewelry company de Grisogono, on a white gold ring mounting, studded with 702 white round brilliant-cut diamonds, with a total weight of 36.69 carats. 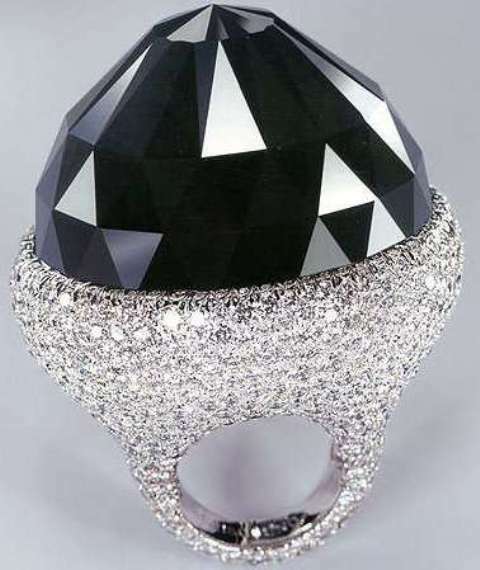 This spectacular black and white diamond setting, laid the foundation for Fawaz Gruosi's successful experiment in popularizing black diamond incorporated jewelry, diamonds previously rejected as mine bort or carbonado, considered fit for crushing only for industrial purposes. Sale of the Spirit of de Grisogono diamond ring? It has been reported that the Spirit of de Grisogono diamond ring has been sold by its owner Fawaz Gruosi to an anonymous client for an undisclosed sum. However, this report has never been confirmed. The Moghul-cut being an old cut developed during the classic Moghul period of India from 1556 to 1707, ie the period from the time of ascension of Emperor Akbar till the death of the last great Mughal Emperor Aurangzeb, is found in many diamonds originating from this period. 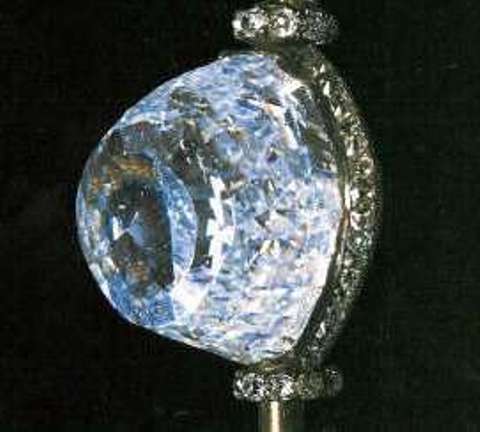 Some of the famous diamonds that originated during this period and show this ancient form of cutting developed in India, are :-the Orlov diamond preserved in the treasury of the Kremlin Diamond Fund in Russia; the long-lost Great Mogul diamond described by Tavernier in his book "The Six Voyages of Jean Baptiste Tavernier" with the aid of a sketch; the Taj-i-Mah diamond and other Moghul-cut diamonds of the Iranian Crown Jewels, preserved in the Museum of the Treasury of National Iranian Jewels in the Central Bank of Iran,Teheran. The above sketches, are from Chapter XXII of Part 2 of Tavernier's book, "The Six Voyages of Jean Baptiste Tavernier." Sketch No.1 is a depiction of the Great Moghul Diamond, which according to Tavernier weighed 280 carats and was cut from a larger rough stone that weighed 787 carats. 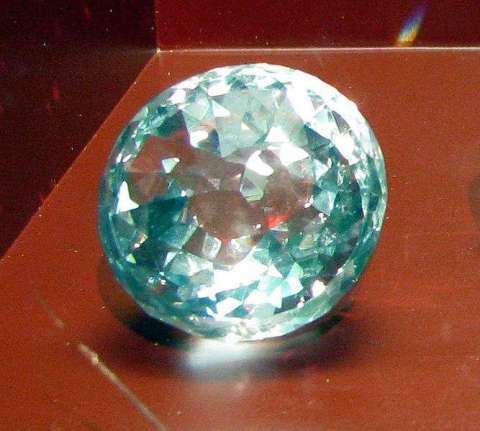 Some historians believe that the Orlov Diamond is actually the long-lost great Mughal Diamond. There is strong evidene to support this view, but it is yet to gain universal acceptance. Please read Orlov Diamond for more information. 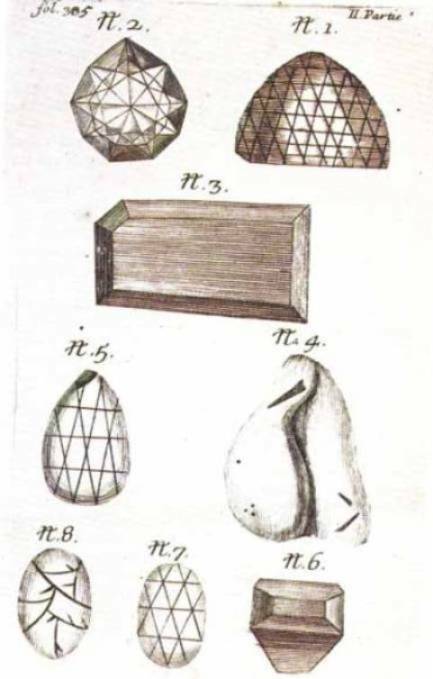 Sketches 2 & 3 are respectively the Florentine diamond and the Great Table diamond. Sketches 4 & 5 represent respectively the Ahmedabad rough diamond and the pear-shaped Ahmedabad diamond after cutting. Black diamonds, also known as Carbonodo have long been a puzzle for Geologists. There has been a controversy about the origin and the distribution of naturally occurring black diamonds in the world today. A comparison of the characteristics of black diamonds as against conventional diamonds can be very informative and interesting. 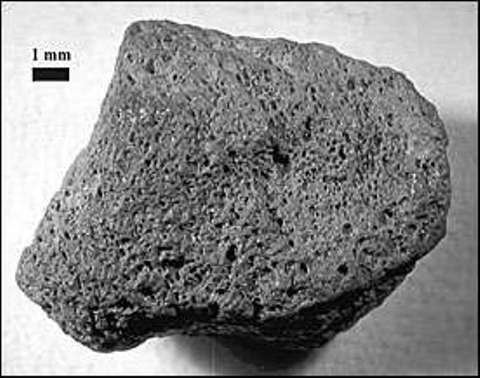 Black diamonds are porous, like pumice formed from larva of volcanoes. They appear to be composed of millions of minute diamond crystals stuck together. They are polycrystalline. Conventional diamonds are non-porous and exist as large crystals, with a classic crystal structure. They are monocrystalline. The porous material is full of bubbles that appear to result from gases present when the diamonds were formed. Gases found are mainly hydrogen and nitrogen. The presence of hydrogen is a evidence for the stellar origin of carbonados. 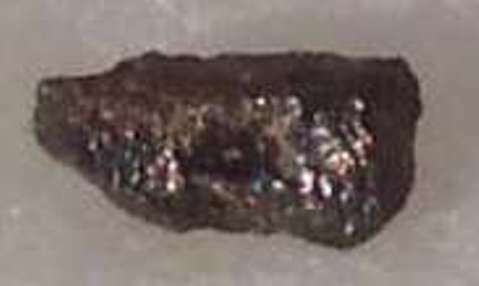 Black diamonds are found in alluvial deposits, and never found in Kimberlite pipes, indicating that black diamonds were not formed inside the earth's crust. Conventional diamonds are found in Kimberlite and Lamproite pipes as well as nearby alluvial deposits, which indicate they were formed deep inside the earth's crust, and later brought up to the surface. Conventional diamonds are the hardest substances known, but they are less hard than the harder black diamonds. The extreme hardness of black diamonds is attributed to lack of crystal planes along which cleavage can occur. Black diamond are more suitable for industrial uses such as grinding and drilling and less suitable for ornamental purposes. Conventional diamonds are more suitable for ornamental purposes. Today the only important sources of black diamonds in the world are Brazil and Central African Republic. Not one black diamond has ever been produced in the conventional diamond mines of South Africa, Russia, Australia and Canada, the main sources of the approximately 600 tons of conventional diamonds produced in the last century. The two main black diamond locations in the world are isolated and separate from the conventional diamond locations. 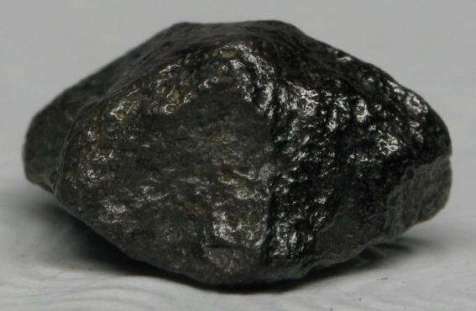 This coupled with the fact that black diamonds are only found as alluvial deposits has given rise to the speculation that black diamonds came from outer space, and have a extra-terrestrial origin. A team of Geologists from the Florida International University, has proposed that an asteroid of about half a mile in diameter impacted the earth billions of years ago, when South-America and Africa were once connected land masses. The deposit of black diamonds are today thousands of miles apart because of the continental drift, that occurred afterwards. 8) The Regents Earth Science and Regents Physics Web Resource for Students and Teachers- created and maintained by Michael P. Klimetz, Science Department, John Dewey High School, Brooklyn, New York.